What do you consider the most dire moment in a Bond film? My direst moment in a Bond film? No contest! Lee Tamahori has much for which to answer in foisting upon undeserving Bond fans that truly dreadful, third-rate piece of CG that mars "Die Another Day". You know the moment - that 2:50's worth of cinematic detritus from the moment our hero goes over the ice cliff in Gustav Graves's rocket-fuelled racing car and through the moment he emerges triumphant, sail-boarding the resultant mini-tsunami. For Tamahori to have directed this most embarrassing scene in the entire Bond canon is one thing: for La Broccoli and Michael Wilson to have okayed it is quite another - and utterly indefensible. I agree with yours, the rocket car and the ice para-sailing in DAD. Its a shame because I really enjoyed DAD, I even put up with madonnas crappy theme, then once bond arrived in iceland it went downhill really quickly. Daniel Craig's QOS gun barrel fast duck walk. CR featuring a toilet in the pre-credit scene. Toby Stephens acting in DAD. Roger Moore's final ever scene as James Bond ending with a Carry On type "ooher" line (in the shower with Stacey). paragliding the etchasketch cgi tidal wave in DAD. Low point of the series - and may be the decade. Ellliott Carvers kung fu moment is next. Maybe if you're in the right mood you might like it, there's a few nice moments, but it's one heck of a mess of a film! The soundtrack is wonderful though. Well, that movie was prophetic of what the franchise was to become during the Moore years. Everything was there: use of other movies' themes, funny animals, plots that made no sense whatsoever, and so on. The laser scene in Die Another Day. At least the surfing scene was original, this was just a bad parody of one of the best film scenes of all time. Made me feel like I was watching Epic Movie or one of Friedberg and Seltzer's other festering turds. Not one redeeming feature, the scebe didn't even have Miranda Frost in it. The original CR features one of the greatest easy listening pop songs- Burt Bacharach's The Look of Love. So we can forgive the rest of the film because that song is too good! without doubt the iceberg surfing sequence in DAD. OMG what was Tama hori thinking? I agree 100% with all the comments re: the infamous CGI iceberg scene. Truly embarrassing for any film let alone Bond! Even Roger Moore would have been embarrassed! A poor way for Brosser to exit the series. Also not a big fan of Sean turning Japenese in Twice or the fight Moore has in AVTAK involving the use of salt-loaded shotguns against badly-wigged stuntmen heavies! Actually most of that film contains most of the series low points ie " ooh James" from the glamourous but vacuous Stacey Sutton. Only 2 redeeming features of AVTAK, the great Chris Walken and Duran Duran theme song. 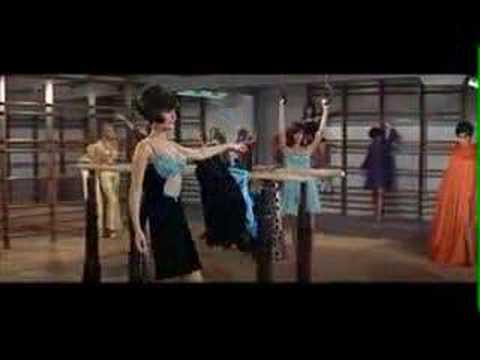 Blofeld cross-dressing scene in DAF is also very cringeworthy. The entirety of DAF. Just plain awful. The Die Another Day parasurfing of course. DAF. Mainly any time Tiffany Case is on the screen, and I guess when Professor Doctor Metz (what is up with that name?! ); Blofeld's okay, but I think they should have stuck with Telly Savalas. MR. I can accept Jaws falling in love (even bad guys have a heart) but Drax and his space Nazis... no. DAD. The movie. Outside of an awesome sword fight sequence and a great Q Lab, there's little to like about this film. I do kind of like Madonna's song, though. I'm afraid I cant quite agree on the parasurfing. I would have to give my vote to the invisible car. As soon as that abomination hoves into view the film is already lost and the parasurfing is just the cherry on the top of a very big turd cake. And on paper the parasurfing to escape a collapsing glacier and tsunami sounds stunning whereas the invisible car sounds laughable on paper, on film on any medium. - Sean being made to look Japanese.... was it really that necessary?.. and also, it was a lousy job too - all they seemed to do was mess up his hair a little..
- Moonraker's climax taking place in space.... this didn't need to happen, but it was the crux as to why they fast tracked this Bond outing - to take advantage of the new special effects technology pioneered by Star Wars 2 years earlier... the climax of the film could've easily had taken place at Drax's shuttle base in the amazon, rather than drag us into the cosmos..
- Denise Richards' casting in TWINE... I would find it hard to believe that her readings beat out every other actress that auditioned for the role (if auditions even took place - based on the fact that they signed Richards on). - Invisible Car in Die Another Day... I couldn't care less if it's based on any existing (or at the time, in development) technology - it was still a bad idea... especially since Bond tries to hide behind it at one point before getting in (dumb)... and it really has no amazing payoff, when Bond kills Zao by turning invis and letting diamond face plung off the balcony - that could've easily had been done without using the invisibility.... stupid.... not to mention, driving the car around in the snow would leave tire tracks everywhere. - CG Bond windsurfing over CG Tsunami....... the biggest load of crap in Bond film history.... as crazy as the Bond stunts usually are - there is something about the majority of them being done practically (ie: the ski jump in the PTS of TSWLM, or the sky dive in the PTS of MR) that makes them memorable... this scene is memorable alright - but for all the wrong reasons... this bit even makes the ridiculous sky diving into a plane in the PTS of GE look good.... the CGI in the whole film, especially in this scene are terrible, even for the hollywood standards of the time - and looking back by standards of today, it's even worse...... the only thing i think that almost tops this is in the movie, is Graves trying to kill Bond with Force Lightning during the climax. When I first read 'dirtiest moments' I was expecting something different actually. what we have above aren't really 'dirty' moments or what you could possibly define as 'dirty', silly, inappropriate or lame would be better. it's direst moments... not dirtiest. AVTAK: all of it, the absolute nadir of the series. It was the worst of Moore's tenure without any question, an absolute embarrassment to both Moore and the franchise as a whole, he said so years later in hindsight it was a poor choice for him to have gone ahead with it at 57 years of age. Not just that but it's a disaster, California Girls, Moore (well his stunt double actually) doing ski somersaults amd fancy stunts to said music, and to skip the rest of it, an absolutely cringe worthy finale in San Francisco with Moore sailing through the skies and subsequent Golden Gate bridge nonsense. No, your eyes are fine. I don't like Auric Goldfinger (film or novel). In Dr No on Crab Key where Bond tells Quarrell; "Fetch my shoes". This scene is so shameful that no one seems to recall it. The critics or the affacionados never mention it. I for one never forgot it. Up to this point in the film Quarrel was treated with sympathy and as Bond's equal. But after they meet Honey (white woman) then Bond feels he has to exert his (white) manhood and start ordering Quarrell around like some Mississippi cracker. This is so shameful. YOLT Bond going "Japanese". It was stupid and also explicitly racist. It harkens back to the 1930's when they used to make up caucasian actors to play Chinese characters Charley Chan, Mr Wong) because they did not want to give the lead to a Chinese or Asian actor. MR The space Battle had me cringing as did most of the movie following the PTS. AVTAK Everytime Tanya Roberts screamed. LALD Kanaga's death. Really stupid and unrealistic. they should have had the sharks finish him (like in the book). DAF Kidd and Wint's flamborant homo sexual behavior and Blofeld in drag-ouch! DAD The parasurfing. The invisible car. Halley Berry's awful dialogue and subpar acting. DAD after Cuba - no brainer really. What do you consider the dirtiest moment in a Bond film? Welcome to the forums @tommychameleon, and nice avatar! Every scene in DAD where Jinx is breathing!!! nah NSNA where Connery and Basinger get on a horse and JUMP Off a cliff into the sea....the most ridiculous thing i have ever seen...and the horse still survived.